Take your Maximo enterprise spatial. Put our spatial asset management expertise to work. Easily create and update Maximo records using Esri ArcGIS services, preparing Maximo for spatial visualization. 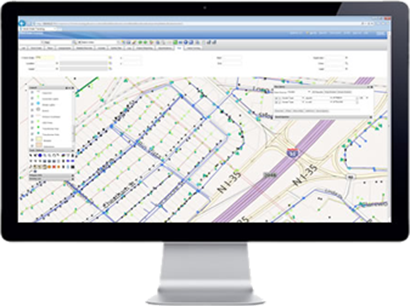 Premier spatial integration for Maximo and ArcGIS. 20 years of spatial asset management experience bundled into one powerful application. Now you can leverage the power and map-centric goodness of Esri mobile applications to update Maximo with field-collected data—in a snap. ActiveG MapEngine™ seamlessly integrates your Esri ArcGIS and IBM Maximo systems, embedding dynamic maps directly into IBM’s strategic asset management solution. ActiveG MapEngine brings Maximo and Esri ArcGIS together by map-enabling your Maximo system, and integrating Maximo and ArcGIS at both the data and application levels. ActiveG PowerSync™ is an intuitive, powerful tool for using GIS data to create and update Maximo Assets and Locations, and prepare your Maximo data for spatial visualization in Maximo. Whether you’re loading data into Maximo for the first time, or you want better data management for Maximo, ActiveG PowerSync efficiently and easily gives Maximo quality data based upon Esri ArcGIS map services. If your company uses IBM Maximo® Spatial Asset Management, ActiveG can help you upgrade, install, configure, and customize Maximo Spatial to fit your needs. Our experienced team of GIS and Maximo experts will help you navigate the configuration complexity to help you get the most out of your investment. And we can make Maximo Spatial even more powerful by creating spatial widgets that fit your business processes.